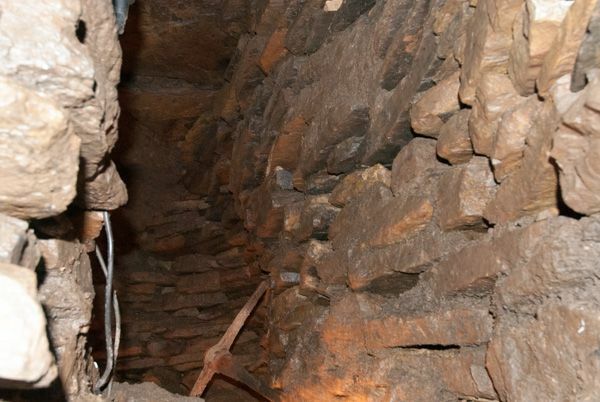 Mine Howe is a mysterious underground chamber near Tankerness, Orkney, accessed by a steep flight of 29 steps. The chamber was built around 200 BC - 500 AD, but its use is uncertain. 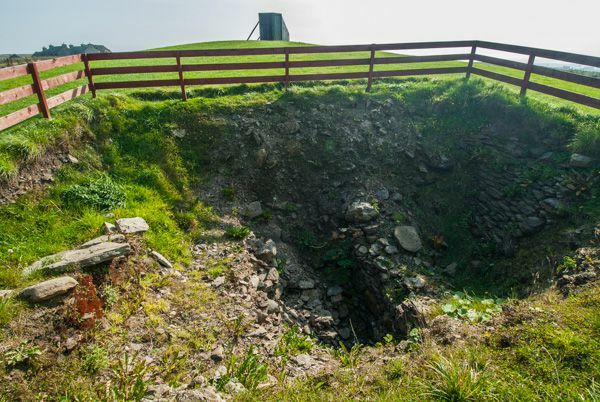 This peculiar Iron Age site almost defies description; it is unlike anything else on Orkney. Was it a religious centre, an underground storage area, or something else entirely? No one knows for sure. 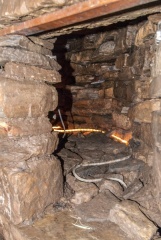 The first excavation took place in 1946, and a rock-cut chamber was discovered. The site was thought to be an Iron Age broch and was sealed up after the dig. In 1999 a local farmer rediscovered the entrance and cleared it of debris. What he found was a series of 29 stone steps that descend to a landing, where they turn back on themselves. At the landing two side tunnels branch off at right angles. 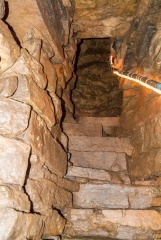 The steps continue down to a chamber at the bottom of the mound, with a very deep step into the chamber. 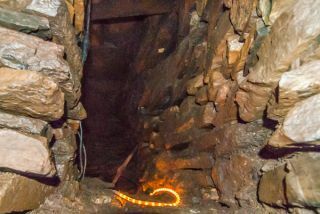 Watch your step; it is a long drop into the chamber! When it was excavated archaeologists found bones and pottery in the chamber. Our best guess is that the central chamber and passages had some kind of ritual purpose. 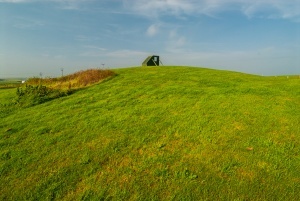 The mound is surrounded by a wide causewayed ditch, and a settlement grew up outside the ditch during the Iron Age or later Pictish era. Was the settlement built here to be near a sacred site? Mine Howe (or Minehowe as it is sometimes spelled) was the subject of a Time Team episode in 2000. As part of the investigation the Time Team crew built a miniature replica of the stairs and chambers. This quarter-scale replica still stands near the original. Since we visited Mine Howe several years ago there seems to be some confusion as to whether or not it is still open. All I can say is; it was open when we visited, and we really enjoyed the experience! Do wear clothes that you don't mind getting dirty, though! Mine Howe is a bit 'rough and ready' compared to other archaeological sites on Orkney; there were not any visitor facilities to speak of, but what sticks in my mind is the sheer mystery of the place. 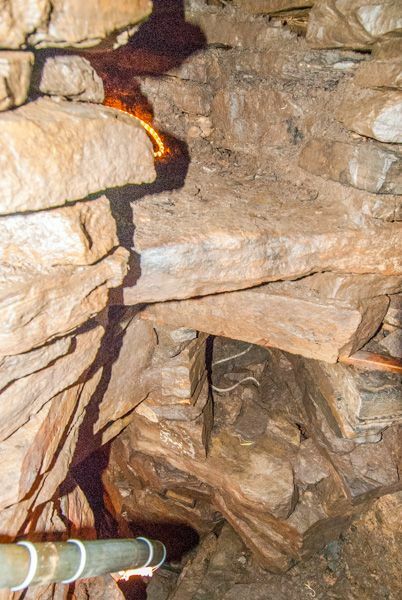 Time Team presenter Tony Robinson described feeling uneasy in the chamber; certainly, there is a sense of the unknown, but perhaps that's because we simply don't know what Mine Howe is or why it was built. Nearby accommodation is calculated 'as the crow flies' from Mine Howe. 'Nearest' may involve a long drive up and down glens or, if you are near the coast, may include a ferry ride! Please check the property map to make sure the location is right for you.